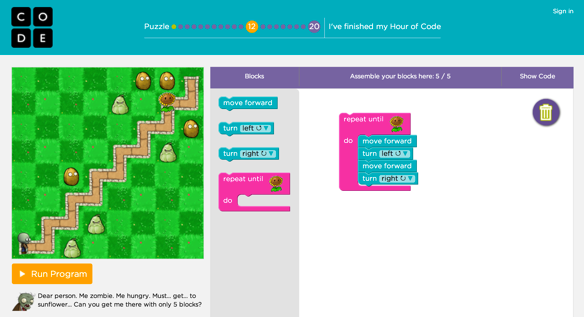 Code.org offers several different tutorials that students can try. We looked through several together, and I asked Z to choose which one looked the most interesting to her. I’ve personally been a bit wary of the Disney-sponsored Frozen-themed tutorial that has been promoted this year (another blog post for another day), so I felt personally excited when Z bypassed the princesses and chose the one titled Write Your First Computer Program. The tutorial was pretty simple, and the instructions were easy to follow. The biggest challenge at first was to figure out all the tiny details, like making sure your character is facing the right direction before making him walk forward. In the example below, if you want your little cartoon zombie to eat the sunflower, you need to first make him walk forward, then make him turn left, then make him walk forward, then make him turn right. This needs to repeat six times. If you make him turn before walking forward or walk forward too many steps, he will walk off the path and fail in his mission. Perhaps the biggest challenge for Z was the very same challenge that I encounter when I’m doing Codecademy tutorials…you have to conform to what the tutorial wants you to do. Once you learn the basic concepts, the naturally creative person wants to explore and play. You can do whatever you want in the tutorials, but when you run your code, the program won’t let you move onto the next level until you do what it’s asking. It was about halfway through the tutorial that Z started wanting to do her own thing. At one point, the tutorial wanted her to make the zombie move around the course in a “C” shape by using a “repeat” block with “move forward” and “turn right” inside (rather than stacking several “move forward” and “turn right” blocks on top of each other). This means that you can use only three commands to get the Zombie to his goal, rather than six. Z knew exactly what the tutorial wanted her to do, but wanted to do it her way. She did what the tutorial was asking by incorporating the “repeat”, “move forward”, and “turn right” blocks, but insisted on creating a repeating loop of “turn left” blocks at the beginning, to make the zombie do a little dance before completing the course. Thus, she did what was asked and completed the goal, but in her own way. Creativity ruled the moment! Urban Dictionary defines “hack” as: “a clever solution to a tricky problem”, or “to mod or change something in an extraordinary way”, and I realized that perhaps Z was a born hacker. She was determined to complete the goal, but sought her own rules of engagement, which made me proud! Click anywhere on the image to view the video in Scratch. Impressed? You can leave Z a comment! This explanation completely spoke to this girl who is collaborative and social by nature. She excitedly shared her video, and looks forward to any interactions it might provoke. If you are inspired by her, feel free to leave her a comment or modify her video according to your ideas! Overall, I was completely inspired by this experience. After just three short hours, this girl had learned some important fundamentals, and was excited about the possibilities of coding. She clearly saw it as yet another outlet for her natural creativity. We have every intention of finding more time to code together, and I can’t wait to see what she does next! There is a time and place for guided instruction, but also an important time and place for open-ended exploration. What is the balance? This video was the product of a fairly open-ended exploration…an experiment in combining different elements to see what they do. How would Z react if I asked her to define and plan a goal first and then try to figure out how to execute it? 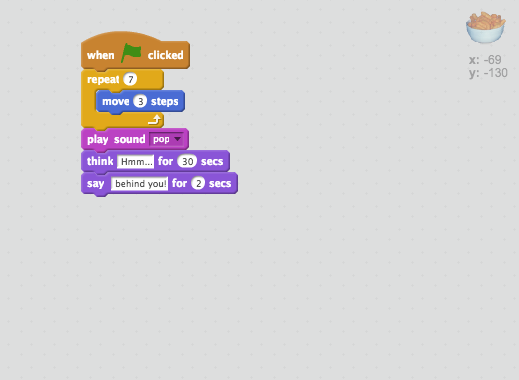 What would we learn by spending time looking through other Scratch projects to see what others have done? Could we find a project we like, start with their code and modify it? 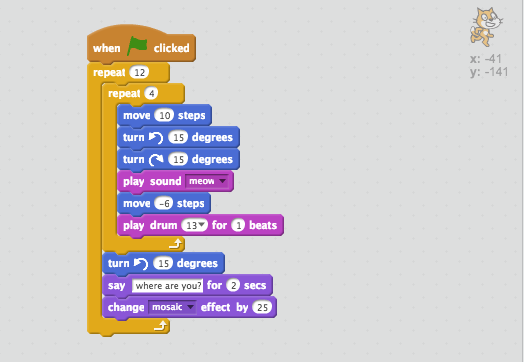 What new thinking would be inspired if we invited another similar-aged friend to explore Scratch together with Z? Interested in learning more about digital nativism? Check out the article “Digital Natives, Digital Immigrants“, by Marc Prensky. What I did find out with the codeacademy RUBY was that once you have done what they ask and it says you can move on, there is a little icon at bottom right which lets you back in to the coding screen, and you can put whatever you like there. Just ignore the error messages and keep going, doing “your thing”.